The PXI-9527 is a high-performance, 2-CH analog input and 2-CH analog output dynamic signal acquisition board. This board is specifically designed for audio testing, acoustic measurement, and vibration analysis applications. The ADLINK PXI-9527 features two 24-bit simultaneous sampling analog input channels. The 24-bit sigma-delta ADC provides a sampling rate up to 432 KS/s at high resolutions, making it ideal for higher bandwidth dynamic signal measurements. The sampling rate can be adjusted by setting the onboard DDS clock source to an appropriate frequency. All channels are sampled simultaneously and accept an input range from ±40 V to ±0.316 V. The PXI-9527 analog input supports software selectable AC or DC coupling and 4 mA bias current for integrated electronic piezoelectric (IEPE) sensors. 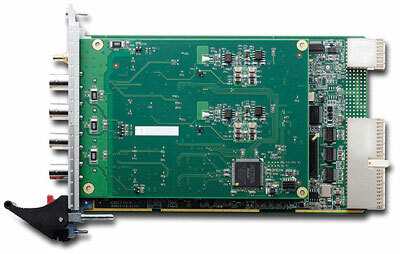 The ADLINK PXI-9527 also has two channels of 24-bit resolution, high fidelity analog output. The outputs occur simultaneously at software programmable rates up to 216 KS/s. A software programmable output range of ±0.1 V, ±1 V, and ±10 V is available on the output channels. Watch a Flash demonstration to see how the high-resolution dynamic acquisition to optmize your speaker testing. Historically, testing of acoustic response in audio playback devices has required critical performance analysis conducted by specialized audio engineers. 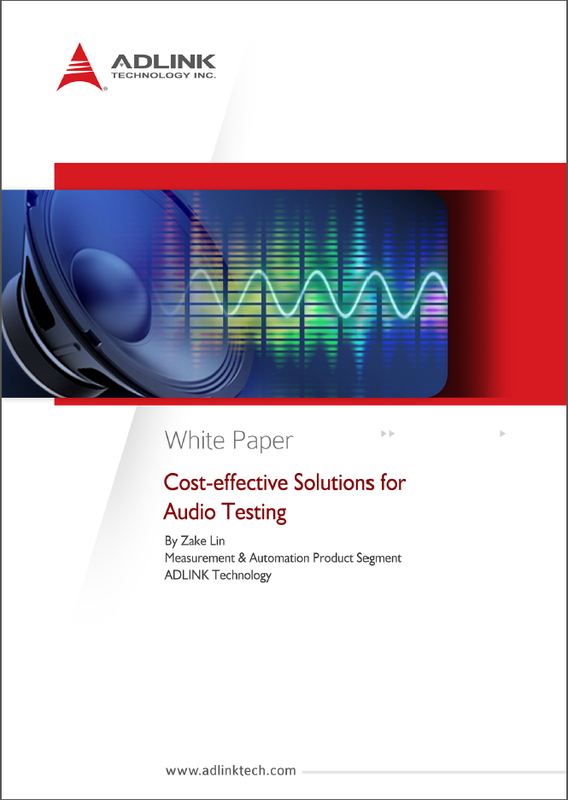 In addition to design verification, acoustic response testing is also important in production line testing of multimedia devices. Currently, many multimedia devices such as MP3 players, mobile phones, and car stereos utilize speakers. Accurate frequency response measurement and detailed harmonic distortion analysis during speaker production testing require high resolution dynamic signal acquisition modules with flexible analog input/output function and high dynamic range. AO output, for example, generating a multi-tone or stepped sweep sine signal, may be employed as a stimulus for a speaker. To convert speaker output to a voltage signal, a calibrated microphone may be employed as a sensor. AI input can then acquire the signal output from the microphone and perform a fast Fourier transform (FFT) to analyze the measured audio signals, providing frequency and impedance response and harmonic distortion analysis. 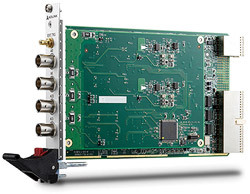 The ADLINK PXI-9527 features 2-CH 24-bit simultaneous sampling analog input. The 24-bit Sigma Delta ADC provides up to 432 KS/s sampling rate and high resolution, ideally suiting it for higher bandwidth dynamic signal measurement. The sampling rate can be adjusted by setting the onboard DDS clock source to an appropriate frequency. All channels are sampled simultaneously and accept input range from ? ?40V to ??0.316V. PXI-9527 analog input supports software-selectable AC or DC connection, and 4mA bias current for integrated electronic piezoelectric (IEPE) sensors.